Yoga Nidra is a practice that is deeply relaxing, restorative and transforming. It is an ancient practice, recently rediscovered and has become popular now for its fantastic de-stress effect and deep relaxation benefits, though it is also a legitimate form of meditation and mind-body therapy. Yoga Nidra literally translates as the ‘yoga of sleep’, though this can be misunderstood as actually through yoga nidra the practitioner awakens deep parts of themselves that are dormant in normal daily life. In the ‘state of yoga nidra’ the practitioner is hovering in a place of near-sleep. To do Yoga Nidra is gentle, simple and accessible to all. It is best if you can be guided into by a teacher, but it can be practised with an audio or self-guided. The practitioner is lying down and guided in systematic form through their body and breath, eventually into the recesses of their mind and imagination. The process induces a state of calm awareness. Many people around the world use Yoga Nidra to help them sleep as a result of its effectiveness at calming the mind. Practitioners often say that it brings immediate physical benefits, such as reduced stress and better sleep. Yoga Nidra also has the potential to heal psychological wounds. As a meditation practice, it can offer a profound sense of peace and wellbeing. Yoga Nidra takes the practitioner to a deeply relaxing state between wakefulness and sleep, known as a hypnagogic state. In this state we are more able to adjust our reactions to our life’s problems. The adjustments are done through gentle suggestion during the guided visualisation and body awareness. By meeting difficulties in this relaxed state and blending our difficult emotions along side positive visualisations it changes the way our body and mind react to negative emotions. Eventually through regular practice the positive suggestions shine more than the presence of the negative thoughts, and so dilute the negative emotional charge until it is reduced to a comfortable level. Also, in the state of Yoga Nidra we tap into the parasympathetic response, or the rest/digest/heal part of our nervous system. This is opposed to the more reactive and common fight/flight/freeze response which we spend the majority of our lives. The parasympethic state allows us to maximize our ability to process, heal, and rejuvenate so that we can live a more joyful and peace-filled life. Interested in taking a Yoga Nidra journey with Divya? I have been practising Yoga Nidra regularly (daily) since 2012 and found it not only helped improve my sleep patterns where other all other tactics, healing remedies and strategies had all failed (so, a big deal), but it also sparked a feeling of joy and contentment inside that wasn’t reliant on or affected by anything going on in my life. To this day, that spark of joy remains. 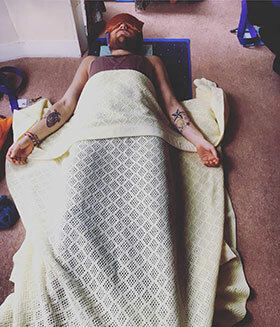 I have studied Yoga Nidra in India, as part of my yoga training courses, and in the UK, as part of my Restorative Yoga Training, and as stand-alone courses investigating the practice of Yoga Nidra and how to facilitate it for others.